Similar reactions were seen when Heineken deployed beacons to drive purchase intent, in-store sales, and brand awareness in conjunction with the release of the 2015 James Bond movie ‘Spectre’ which led to $320,000 estimated revenue from the campaign and 200,000 in-store and point-of-sale engagements. In places that are new to you or too big to navigate on your own, it can often be a hassle to ask around for directions. 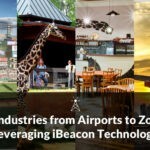 Beacons can be utilized to solve this problem, like in the case of the Hong Kong International Airport, and Kariru Library in Japan. Hong Kong International Airport’s ‘HKG My Flight’ app was launched in 2013 and was beacon-enabled in 2015. The app enables passengers to receive push notifications of airport information such as the security checkpoint with the shortest line, nearest restaurants and the discounts offered, which gate is the plane leaving from and directions for the quickest way to that gate. Kariru Library in Sabae, Japan launched an indoor navigation app, where 131 beacons were installed in the two-storied building. This has allowed for a special feature in the app which not only helps in general navigation around the library, but also helps in finding the specific location of certain book stacks. When a shopper enters a store, a beacon near the entrance communicates with a mobile wallet on the shopper’s phone and reminds the shopper that there is a redeemable coupon in his mobile wallet. The shopper might be spurred to make a purchase, rather than just wander the store without buying anything. Beauty giant Sephora, for instance, used beacons in combination with mobile wallets in its ‘Beauty Insider’ programme. When shoppers entered a Sephora store, in-store beacons alerted them about products through their mobile wallets. Shoppers were also notified about getting mini-makeovers at the store’s Beauty Studio and reminded to use their Beauty Insider card to get points. These efforts by the store have helped them increase customer loyalty. Beacons can help improve networking, one of the primary reasons why people attend events, by providing users a mobile view of other attendees around them. Combining this with Linkedin integration will enable your app/platform to match profiles based on attendees’ interests and send them notifications when they are in close proximity to a match. The Cannes Lions International Festival 2015 used iBeacon technology to offer attendees a personalized experience featuring relevant content surfacing and meet-ups with like-minded event-goers. A few of the new beacon-enabled features offered by the official Cannes Lions app are the ‘Around Me Enhanced’ and the ‘Icebreaker’ feature. While the Around Me section allows festival goers to find people who have checked into venues and also see which sessions are the buzziest, the latter feature taps into Linkedin to match users who attend or favorite the same session. Customer loyalty programs are all about keeping your current customers engaged and happy, while keeping a good check on their experience. Beacons not only provide an easy way to do away with traditional loyalty cards, loyalty stamps and coupons but also help gather a wealth of data about customer preferences and behaviour. One of New York City’s dominant pharmacy chain and subsidiary of Walgreen Co., Duane Reade, leveraged iBeacon technology at ten of its stores in 2014 to boost its loyalty program. According to Duane Reade, customers received notifications on their lock screen as they approached a store in which beacons were installed. They also got discount offers based on what they had previously purchased and had product reviews pushed to their devices as they evaluated items in the store. Gamification is forecasted to be an essential element for brands to drive customer marketing and loyalty in 2016. Not surprising, given how retail adoption of the gamification strategy has escalated to 31% in 2015 from 6% in 2014, and is projected to increase by 181% in the next five years, according to a report by Boston Retail Partners. Beacons can help brands with this by creating positive brand awareness while offering enhanced visitor engagement. Fabergé, a luxury jewellery brand, staged the Big Egg Hunt in New York in April 2014. Each egg in this hunt had a beacon installed inside it. Participants who had the app received notifications via beacons when they were within a certain range of the eggs. By checking in, one directly entered into a sweepstakes to win one of the three Fabergé gemstone pendants. 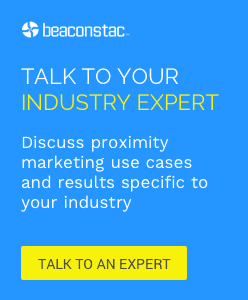 With a plethora of beacon hardware options available in the market, it’s common to have questions about choosing the right beacon hardware for your business. Hence, you must make a firm decision about what type of beacons are right for your campaign keeping a few things in mind. -Should your beacons be battery-powered, USB-enabled, or powered by electromagnetic waves? -Do you need indoor beacons or sturdy all-weather beacons that can be used outdoors? -Will your business benefit more from beacons that come with built-in WiFi for internet connectivity? Effective deployment of beacons can be tricky, hence a proper deployment plan has to be made by taking a lot of things into consideration. Important questions like “How many beacons do I need to effectively cover my floor space?”, “How do I monitor beacon activity and what do I do with the information collected?” and “How do I set up beacons and maintain them on a daily basis?” must be discussed in advance so that you are not blindsided by problems that may have simple solutions. Read more about effective deployment of beacons here. There are a variety of ways to send notifications to customers once they are in the vicinity of a beacon. Notifications are a very important part of your campaign, because they are how you reach out to your customers. They must be concise and to the point to keep the customers interested. Notifications can be in the form of text, media files or links to webpages. Notifications with minimal text can act as quick reminders. Those with images or audio files can be used to describe a certain product or a thing and give more information about it. Notifications which redirect to a particular web page can be employed to encourage consumers to learn more about the company/firm itself. But once you have a campaign out, you need to keep a look out for what your competitors are doing that is doing well out there. A lot of times, your campaign may grow stagnant or out of trend without you realizing it, resulting in the customers gravitating towards products which are much more tailored to their demands. Hence, always keep revising your strategy to match the present trends to stay ahead of competition. Well-timed, contextually relevant push notifications have great impact on consumer behaviour. But, you need to make sure that you don’t overdo it, else it may lead to a loss of valuable customers. Spamming customers with notifications and offers, and incessantly interrupting them is just going to irritate them and they will feel less inclined towards using your product, like in the case of the New York advertising company Titan in 2014. With a solid strategy in place, you’ll be able to establish realistic goals, determine how you’re going to reach them, and be able to measure when those goals have been. There are also many things that you should not do when running a beacon campaign. These simple pointers are the essence of any successful proximity marketing campaign. You should try and implement them too!